It is said that change is good for our brains. When we take a vacation, try a different food, listen to a different type of music, our thought patterns change. Significant benefits can be realized by changing our movement habit patterns. For example, using your other hand to brush your teeth, standing on the other leg while pulling on your pants, putting the other arm into the sleeve first, eating with the other hand, stepping up with the other foot first. Katy Bowman’s Nutritious Movement® program is all about change: Changing how we move, where we move, when we move, how much we move; looking at why we move; and, how changing moves can make a difference in our lives. Our worldview (sometimes referred to as a paradigm) may shift when we experience change. This is the story of how two key paradigms in my life – one about aging and one about communication – have shifted. On the back cover of our book, Dynamic Aging: Simple Exercises for Whole-Body Mobility, the question is asked: “What if your pain and lack of mobility aren’t due to your age, but your habits? What if changing how you move can change how you feel, no matter your age?” My paradigm about aging was that it was “normal” or “natural” to experience pain and deterioration of physical abilities as we get older. When Katy suggested it could be due to my habits rather than my age, I thought, “WOW! What if that were true? 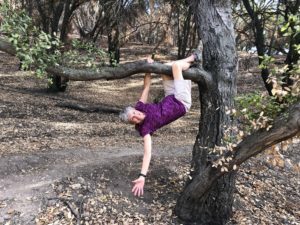 What if I could change how I feel by changing how I move?” And as I learned to move, move better and move more of my body, I experienced a paradigm shift about aging thanks to the changes I was making in my habits and the results. 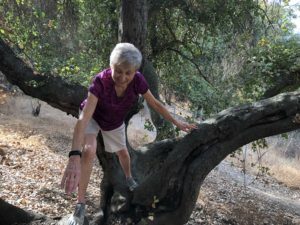 Who knew I could climb and hang by one arm from a tree at 80?!? Over the past six weeks, I have had the opportunity/challenge of making a lot of changes in my habit patterns. I have stimulated my brain and asked my body, inside and out, to move in different ways. Due to voice and throat issues, my doctor recommended I take six weeks and limit the use of my voice. Fortunately for me, exercise can be done without talking. Hiking in the forest, climbing and hanging from trees, balancing on logs, jumping from one space to another, working on my chin-up, increasing the volume of my movement – all can be done in silence. The change from talking to limiting the use of my voice has been one of my most challenging lessons. It meant taking a break from teaching and from talking on the phone for more than a few minutes. I love to teach and taking a break was difficult. Talking on the phone allows me to stay in touch with loved ones far away. Thank goodness there is texting and emailing – AND that’s not the same as hearing a voice. Learning to listen has been life-changing and an amazing gift. I have learned so much about the people in my life. My paradigm shift this time was discovering that communication is as much about listening as it is about talking. As a wife, mother, grandmother, sister, friend, and Nutritious Movement® Certified Restorative Exercise Specialist teacher, I do a lot of talking. I thought talking was communicating. What I learned by limiting the use of my voice is that I allow others more opportunity to talk. When I listen without an agenda about what I want to say next, I can relax and focus on the other person. Listening with the intention of understanding what the other person is saying has led me to improved communication skills. The gift of listening offers rare insights to what the other person wants to share and to what I am thinking. As I return to teaching and talking on the phone, I want to remember what I have learned about listening. First, I can become a better teacher if I first listen to hear what my clients are seeking. Second, I can learn so much more about others by letting them express what is important to them without interrupting. Third, as I learn how to ask curious questions with the intention of understanding, I can elicit more discussion to help clarify communication. Change, for me, is not easy. I love talking! I get comfortable in my habit patterns – physically, mentally and emotionally – and I like it the way it is. However, in my experience, growth only occurs when I am willing to change. It is the desire for change that brought Lora, Joyce, Shelah and me to Katy’s movement program. 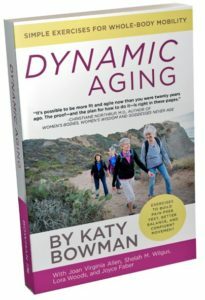 It is the changes in how we move and the dramatic results we experience as we are aging, that motivated our co-authorship with Katy of Dynamic Aging. It is change that keeps us learning and sharing our experiences with you here on our blog. Here’s a challenge/opportunity for you: Take one day and pretend you have lost your voice. No whispering. Just listen. Make it your intention to understand. Watch what happens. Great article with food for thought. Good job Joan! Hummm, not talk for a day…. Joan, thanks for sharing an inspiring personal transformation! Giving us the inspiration to live the movement paradigm that heals the cause of our pain and mobility. WahWhoo! I agree with your article . This is exactly what I have learned through the DNRS (retraining the brain) program. You always have such nice informative articles. Thank you for the inspiration.